Angelo Santiago went on a tear for South Jersey's Buena High School in 1989. He hit .568 on the year, with 45 RBI and 16 home runs, winning the South Jersey Triple Crown, according to South Jersey Sports. Those 16 home runs were also a South Jersey record, a record that was equaled once, but not beaten for 20 years. And it took another South Jersey high school ball player, according to SouthJersey.com, to come and beat it: Mike Trout. From that season, Santiago turned pro. But he couldn't keep the momentum going. His pro career lasted just three seasons. Santiago's career began that season in 1989, taken by the Expos in the 14th round of the draft, out of Buena High. Santiago also went by the name Gus Santiago. With the Expos, Santiago started in the rookie Gulf Coast League. He hit .248, over 62 games, with six home runs and 32 RBI. He picked up two hits in an August game. 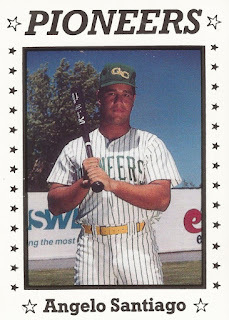 For 1990, he was optioned to rookie Gate City, of the Pioneer League. He hit .241 there, over 60 games. His final season came in 1991, at single-A Sumter. He got into just 19 games. He went 2 for 6 in an April game, but hit just .108, ending his career.